For my first post, I wanted the topic to be auspicious. So I choose to start with stinky tofu. The Chinese have an ingredient called chou dou fu, which literally translates to stinky tofu. Stinky tofu is tofu, fermented/marinated in a liquid that usually consists of herbs and other ingredients that are the maker’s prerogative. After several weeks or months, the tofu is cooked and eaten. 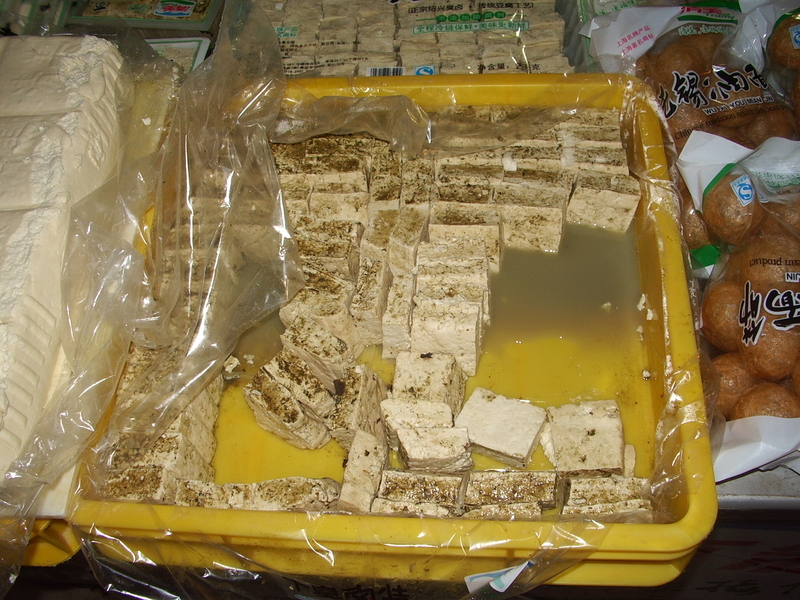 Here is an example of stinky tofu for sale at a vegetable market in Shanghai. My first experience with stinky tofu was many year’s ago. The Cat saw it at an asian market. Since she’s from Shanghai, the stinky tofu made her a little homesick, she wanted to try it. She pan fired it with a little oil. To me, the result was a fail. First of all, the smell was OMG (in a bad sort of way). I thought something died between our walls and was decomposing. I swear the flies were lining up outside of our screen door. I could not get past the smell. Since then, I have become accustomed to (and even like) the fermented soy beans (natto). Strange, The Cat can’t stand the smell of natto. I’m not even allowed to eat it in her presence, go figure, but I digress. So with a more “sophisticated” palate, I was determined to give chou dou fu a fair chance (I was either going to like it, or at least accept it, or it was going to kill me (a little too dramatic)). The opportunity came with our last trip (December 2008) to Shanghai. The first try was at a family style restaurant next to the hotel we were staying at. 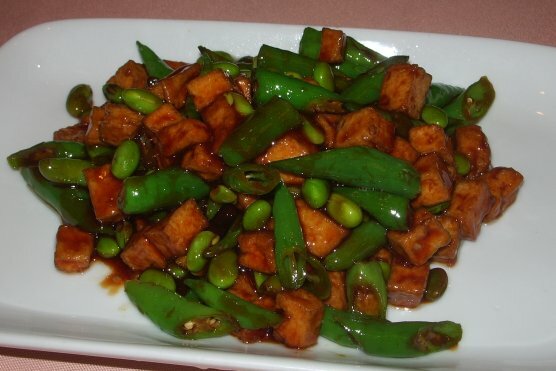 This version was stir-fried with soy beans, string beans, and brown gravy. The smell was not as bad as I remembered, but still quite unique. The taste was not bad. Kind of like fresh tofu with a little bite to it. The texture was a little firmer than fresh tofu. My next encounter with stinky tofu was with dinner with the Cat’s cousin. When the cousin asked us what we wanted to order, my first words were “chou dou fu!” Luckily, the cousin’s daughter also likes stinky tofu. This by far was the best stinky tofu I ever ate (in my short experience, not counting the dish the Cat made). It was deep-fried, accompanied with a chunky spicy dipping sauce, kind of like sriacha sauce. The texture was crispy on the outside and somewhat soft, creamy, and hot on the inside. According to The Cat’s cousin, stinky tofu has beneficial bacterial properties for digestion and health similar to natto. Again, according to The Cat’s cousin, stinky tofu was developed in areas where the presevation of foods were difficult. The fermenting of tofu was a way to preserve food for future use. The Cat’s cousin said that deep-frying was one of the more popular ways of preparing stinky tofu. I guess deep-frying will make almost anything taste better. 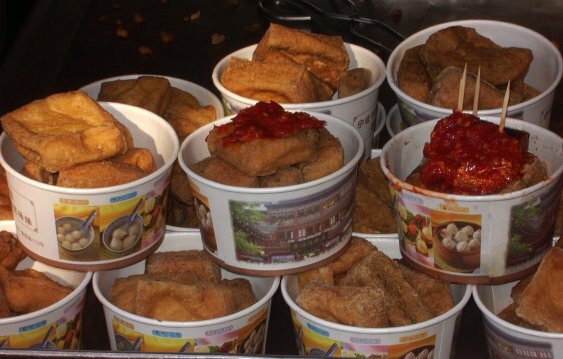 Deep-fried stinky tofu can also be found on the streets of Shanghai. Since this market is in an area frequented by tourists, notice the prettier cups. Also notice that a similar spicy sauce topped some of the cups. I more than survived my encounters with stinky tofu. Yes, I would eat it again. Yes, I would even order it again. While stinky tofu is aptly named, at least the Chinese were honest about calling it stinky tofu, if there ever was a food that is in serious need of a name/branding makeover, this would be my vote. A future challenge might be eating sour poi. Thank you for visiting. Hopefully you like this post. This was started because of our interest in food. Why do we eat the foods we eat? What’s the history behind the foods we eat? on October 26, 2013 at 4:45 pm | Reply Shelli@howsitgoingeh? I had stinky tofu for the first time at dim sum. My caucasian husband loves it so much he puts it all over his rice every time!!! Maybe in a former life, he was Chinese. Hee hee. Next is natto. on November 1, 2013 at 3:27 pm | Reply Shelli@howsitgoingeh? Hmmmm, natto. He’s tried it but not fallen in love with it like me! Stinky tofu is all over Taiwan, where I lived for two years. I never got used to the smell, though I did try it–once! And that was enough. Food is so cultural. It’s amazing. Must admit, it’s an acquired taste, like stinky cheese. Eat well. I rather enjoy stinky tofu…my first time having it was in Taiwan. 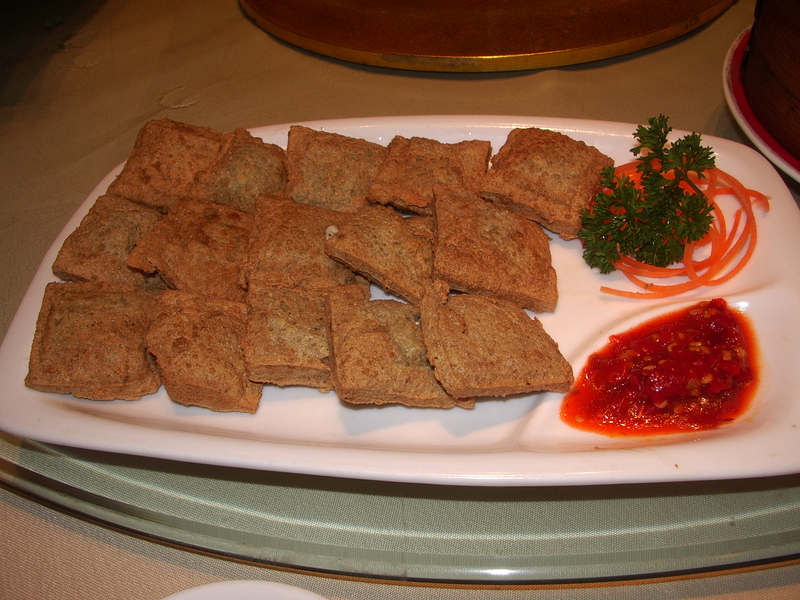 But the stinky tofu in brown sauce looks absolutely delicious!!!!!!!!!!!!!!!!!!!!! Thanks for visiting. The tofu with brown sauce was good, but my favorite are still the deep-fried ones with chili sauce (but then again, almost anything deep-fried has an advantage with me). Hee hee. Eat well. Your blog is a link on my blog today, provided by WordPress, as I wrote a post about natto today. So I came to read your review of natto — then found this post on stinky tofu. I’m willing to try it again — ONCE MORE — in the future. Far away future. I don’t know how anyone can compare the aroma of natto to that of stinky tofu, though; the two simply do NOT compare LOL! Thanks for the fun blog. Beautiful layout, too!